I've always fancied pretty dice. These days there are so many options when it comes to dice too. Although I've been guilty of purchasing and using the GW dice bricks, due to their insanely affordable cost, for the number of dice you get. However, for a few dollars more, there are many options out there to be had, if you want to make a statement when rolling bones. 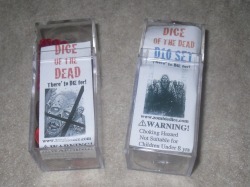 The guys at Battle Bunker Games also own Zombiedice.com, and are responsible for Dice of the Dead. The name alone is a little misleading, because it sounds more like the name of a dice game, than it does a set of dice. As you may have guessed by now, it's just the name they use for their dice sets. At present Dice of the Dead come in two different sets. The original set is a D6 set, and then a D10 set followed. Another set is in the works, called the Apocalypse Edition, but more on that later. The D6 set is an 8-piece D6 set, which are custom Chessex Vortex burgundy w/gold pip D6 dice. What make them special is that the value for 6 has been represented by two different zombie silhouettes, and the bio-hazard symbol. 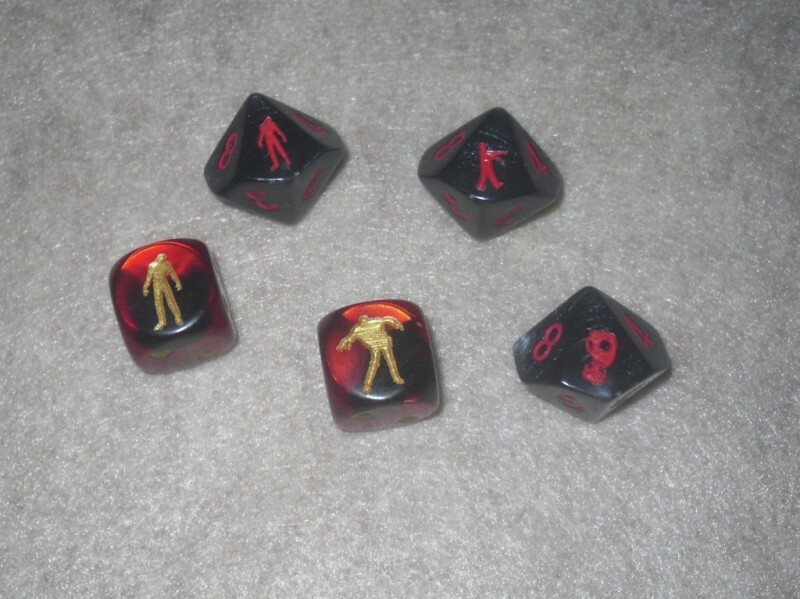 Three of the D6 depict one zombie silhouette, another three feature the other zombie silhouette, and the remaining two have the bio-hazard symbol on them. 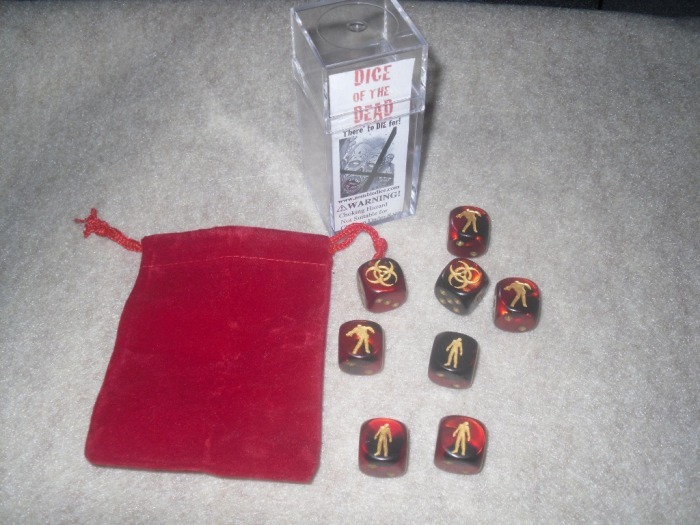 These are the standard 16mm size D6 dice, and they come in a plastic block container, complete with a red velour dice bag with drawstring. The set cost $10 USD, and quite honestly, a 16mm block of 12 burgundy w/gold D6 dice cost $8.75 direct from Chessex, so $10 USD for this nice custom set, plus dice bag is quite reasonable if you ask me. The Dice of the Dead D10 set includes eight standard size D10 dice, and they are dark gray or black with pearl-like swishy, swirly designs mixed in, with red lettering. Actually upon further research, I've determined that these are likely the Velvet set from Chessex. This set is a little different, as it includes three different zombie silhouettes. There's 2 of one, 2 of another, and 2 of the last silhouette, and a single gas mask, and single bio-hazard symbol D10, all of which take the place of the 0 value (technically the 10 value) on each die. 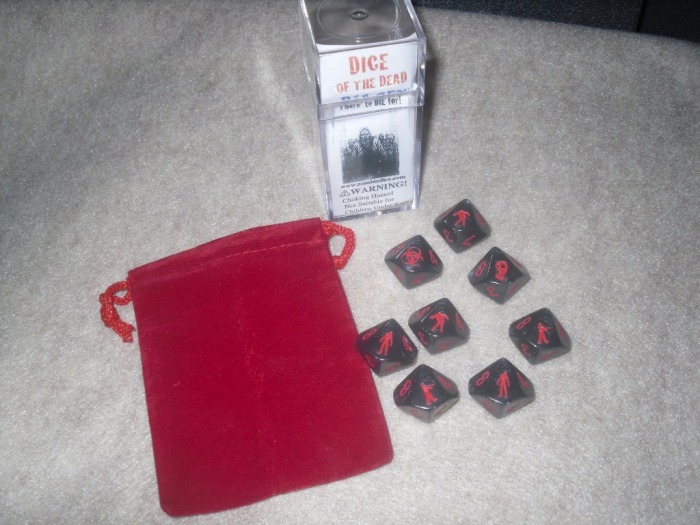 This set also comes in a plastic block case, complete with a nice drawstring red velour dice bag, just like the D6 set. The Dice of the Dead D10 set cost a little more at $12 for the set. However direct from Chessex a 10-piece D10 set of black/red Velvet dice cost $12.50. Therefore you may get two dice less, but gain 8 custom dice, plus a red velour dice bag for 50-cents less than non-custom Velvet dice set, which I think is a really good deal. I don't think you can't find a more reasonably priced set of quality zombie themed dice out there, that can beat the Dice of the Dead deal. I also think these are fantastic dice in general, since these are Chessex custom dice, and cost-wise what they're asking is extremely reasonable, more so since they toss in a dice bag as well. A third Dice of the Dead set is in the works, which they're calling the Apocalypse Edition, and it promises to add a brain, shotgun and chainsaw to the existing stable of zombie designs, and this would bring the design count up to eight. Therefore each die in the Apocalypse set will feature a unique design replacing the value for six on each one. This set will be based on Chessex Vortex Black/Yellow D6, and will come with a black velour dice bag at a cost of $10 USD as well.